Alaska's two Republican senators on Saturday called on Donald Trump to drop out of the presidential race as backlash grew following the release of a video in which the GOP nominee boasted in vulgar language about forcing himself sexually on women. Sens. 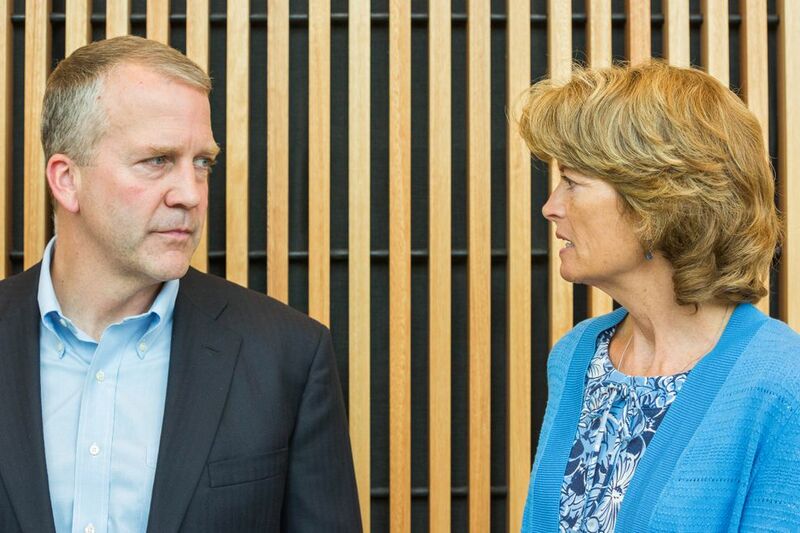 Dan Sullivan and Lisa Murkowski announced their positions in written statements issued minutes apart Saturday morning, saying they cannot support Trump because the tape revealed shortcomings of character that make him unfit for the presidency of the United States. Sullivan had previously supported the GOP nominee and spoke at this year's national Republican convention, while Murkowski, who's running for re-election, withheld endorsement or condemnation of Trump for months. But on a chaotic day for Republicans, both said Trump should end his presidential campaign, joining a group of more than two dozen GOP colleagues in Congress who abandoned their party's nominee after his lewd comments were published. Murkowski, in an interview outside her Midtown Anchorage campaign office Saturday morning, said her decision was "instantaneous" upon seeing the video Friday while she was on a trip to the Southwest Alaska hub community of Dillingham. "You asked how I felt? Disgusted," Murkowski said. She added: "When I saw the video, I said, 'I'm done. This is over.'" Sullivan issued his own 225-word written statement just before Murkowski announced her position on Twitter. He referred to his efforts to "change the culture of abuse against women and children" that's at "epidemic levels" in Alaska. Trump, in the video, referred to grabbing women "by the p—-" and how "you can do anything" when you're a "star." "We need national leaders who can lead by example on this critical issue," Sullivan's statement read. "The reprehensible revelations about Donald Trump have shown that he can't. Therefore, I am withdrawing my support for his candidacy." A spokesman for Sullivan, Mike Anderson, said the senator wasn't available for an interview, adding that the statement "should speak for itself." Trump issued a statement Friday calling the conversation "locker room banter," and apologizing "if anyone was offended." Late Friday, he released a 90-second video saying that his campaign travels had changed him, and offered an unconditional apology. 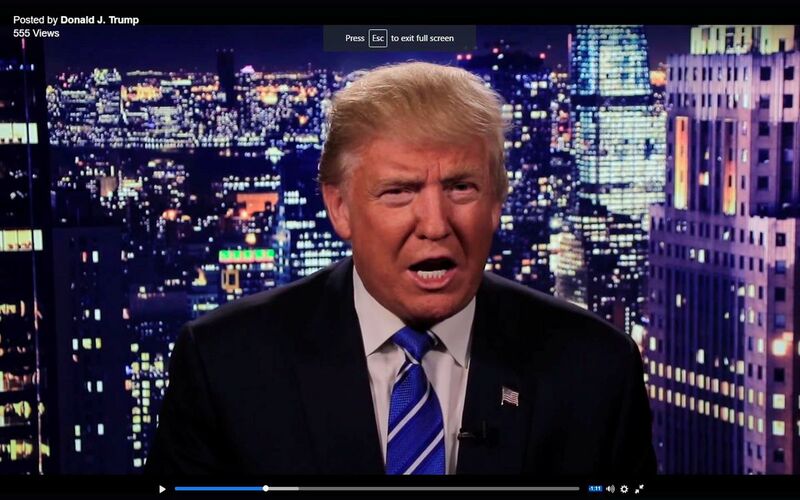 "See you at the debate on Sunday," Trump said at the close of his video statement. He tweeted Saturday that he would "never drop out of the race." The chairman of Trump's campaign in Alaska, Jim Crawford, wouldn't directly respond to the rebukes from Sullivan and Murkowski. But he said Alaskans should still support the Republican nominee. "When you get down to under 30 days, then you're going to take flak for ancient history," he said, referring to the time until Election Day. "This is an 11-year-old story, and he apologized. And there are other things to talk about in the campaign." Friday's video and Trump's subsequent statements sent Republican politicians and operatives scrambling nationwide, with the party's candidates facing a dilemma — how to react without angering Trump's supporters. Other Alaska politicians stayed out of the fray or offered milder statements. Gov. Bill Walker, a Republican-turned-independent who's on a trip to South Korea, said in a written statement that he was "deeply offended" and "utterly disgusted" by Trump's comments. But he wouldn't identify the candidate for whom he'll vote next month. "Gov. Walker continues to evaluate all presidential candidates to determine who is best for Alaska," Grace Jang, Walker's communications director, wrote in an email. Republican U.S. Rep. Don Young issued a two-sentence statement that stopped short of calling for Trump's replacement. "Donald Trump's comments were terrible and extremely demeaning to women," Young said. "Nobody deserves to be treated that way." A spokesman for Joe Miller, who beat Murkowski in the 2010 Republican primary and is now running for her seat as a Libertarian, didn't acknowledge interview requests and instead referred a reporter to a brief Facebook post. "As a husband and the father of four daughters, I found Donald Trump's comments about women reprehensible," Miller's post said. "I take him at his word that he is repentant. I am praying for him, his family and our country." Both Murkowski and Sullivan said they wanted Trump to be replaced. Murkowski, citing what she'd heard from Alaska Republican Party Chairman Tuckerman Babcock, said there was "discussion going on right now, within the party, to look at the process of how we might have a different nominee." Sullivan, in his statement, said he would support Trump's running mate, Indiana Gov. Mike Pence, for president. The Alaska Republican Party also stayed out of the "Donald Trump debacle," as spokeswoman Suzanne Downing referred to it. She said the state party chairman, Babcock, was checking with party leaders about whether to hold an executive committee meeting where official action could be considered, like a withdrawal of support for Trump. Even with recent polls showing Hillary Clinton within striking distance of Trump in Alaska, Downing said her organization was more focused on electing state legislative candidates. "It'll be our challenge to state the case to people that they need to get out, because the legislative races have a much bigger impact on their lives than the presidential race," she said. "There are some big problems in our state, and the solutions are going to be found in Juneau, not Washington, D.C."
Even if Trump did decide to drop out, or if Republicans found a way to oust him from the ticket, his name will still be an option for Alaska voters. The state's ballots have already been printed and mailed to regional sites across the state, said Josie Bahnke, the state's elections director. Her division is legally required to send ballots to overseas voters 45 days before the election, Bahnke said, though she added, "There's write-in space." Sunday is the last day to register to vote in Alaska. Early and in-person absentee voting begins Monday, Oct. 24. Reactions from the few members of Trump's Alaska organization who could be reached ranged from stubborn support to anger to resignation. None said they were willing to vote for Hillary Clinton, the Democratic nominee. "Call me right after the debate tomorrow — talk to you then," said Jerry Ward, the former state senator, before hanging up on a reporter. Three Republicans who were listed as members of Trump's Alaska policy advisory committee distanced themselves from the candidate, saying that the committee never actually convened. "I was asked but never participated," said John Coghill, a Republican state senator from North Pole facing a tough re-election campaign. He said in an interview late Friday that he was living "in my own little bubble" and hadn't seen the video; on Saturday morning, he didn't return a phone call but said in a text message that he still hadn't watched it. "Have heard about it and it sounds like it was vulgar and crude," said Coghill. "Unbecoming of any man." Another Republican listed as a member of Trump's policy advisory committee was Mead Treadwell, the former lieutenant governor. Asked about the video, Treadwell said in a phone interview from Iceland that he was "obviously disgusted with that kind of comment — and while I was growing up, that's not how gentlemen spoke about women." But, Treadwell said, he still isn't sure how he'll vote. "I'm not really crazy about the Clintons, either, so I don't know," he said. "The issue I'm most concerned about is public lands. Mrs. Clinton wants to tie everything up, and Mr. Trump has said he's going to be more receptive to states." Loren Leman, another former GOP lieutenant governor, reached back to the Bible to describe why he still preferred Trump to Clinton. Leman, a social conservative, told a reporter an abbreviated version of the story of King David, who committed adultery, then sent Uriah, the husband of the woman David slept with, to the front lines of battle, where Uriah was killed. "And God later called him 'a man after my own heart,'" Leman said. "That was an example of changed behavior and somebody who repented. The same thing can be true of Donald Trump, Hillary Clinton, you and me." "I'd like to know, in the case of Donald Trump: Has he really changed?" Leman said. Herz reported from Anchorage and Martinson from Washington.